Reports of an oil slick in the Gulf just off Grand Isle, Louisiana this weekend prompted us to take a close look at the available low-resolution MODIS satellite imagery from NASA. Some accounts claimed an oil slick as large as 100 miles long and 12 miles wide, and mentioned a 4-6 hour leak from an offshore well that was being plugged. It seems a couple of things are happening: the Coast Guard does say there has been a leak from a well undergoing plugging operations (we’re still trying to determine exactly which well, and where). 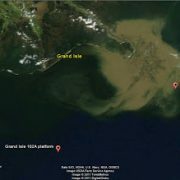 But there is also a huge plume of sediment (and other stuff) surging out of the Mississippi Delta and streaming past Grand Isle, thanks to the spring melt of much deeper than normal snowpack in the upper Midwest, and heavy rainfall in the Mississippi watershed. This sediment plume looks pretty ugly up close: it’s brown, nasty, and carries a lot of stuff in it that is very bad for the Gulf: pesticide and fertilizer runoff, sewage overflows, and oily runoff from all our paved roads and parking lots that’s been building up over the winter. This is what causes one of the Gulf’s worst, chronic environmental problems: the giant “dead zone” that forms every year. Photos taken from the air over the weekend show what looks to me like the leading edge of this nasty sediment plume, not an oil slick. And the MODIS satellite images taken since Friday don’t show any sign of a major oil spill. But there is more to this story: the Coast Guard does say that there has been a leak from a well, and oil from that leak began coming ashore on Elmer Isle, Grand Isle and Fourchon Isle on Sunday. We know that several wells have been steadily leaking at the site of a destroyed oil platform since Hurricane Ivan in 2004, with sporadic work since then to plug those wells; we assume that work has still not been completed. 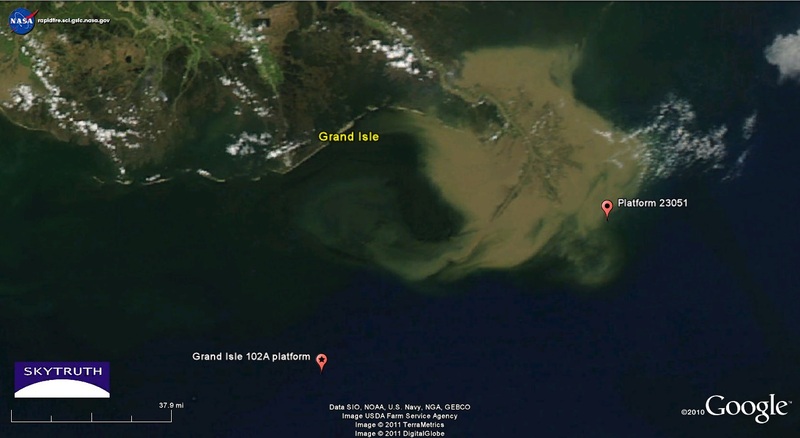 It’s possible the oil originates from that location; the MODIS image shows surface currents moving from the Platform 23051 site toward Grand Isle. Grand Isle Platform 102A is also nearby, about 50 miles south of Grand Isle. This oil platform was evacuated just two weeks ago when it caught fire. The company reports that production had been shut in before the fire, but we’ve seen no followup since then on the status of that platform. Again, based on the free NASA satellite images we’ve seen so far, there is no sign of a large oil spill. We’ll keep looking. Thank you for this information. I appreciate (and will follow) your blog.